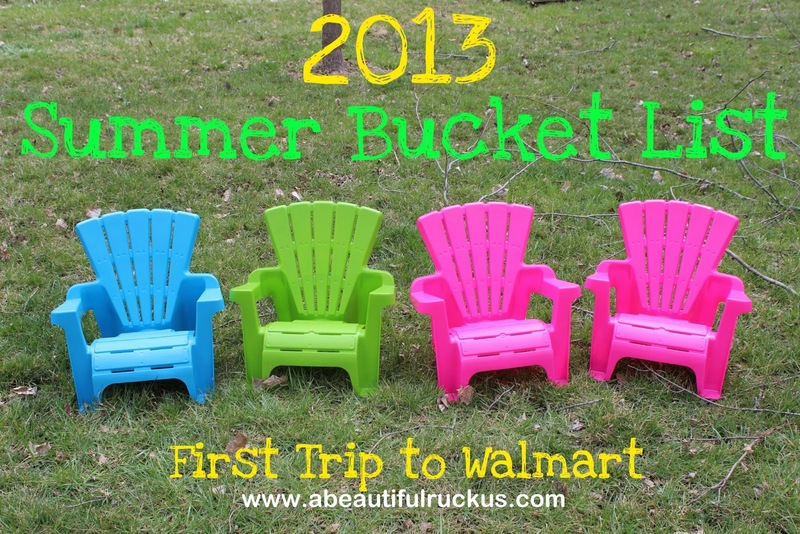 "How is a grocery shopping trip to Walmart worthy of the Summer Bucket List?" Hey, I get it. 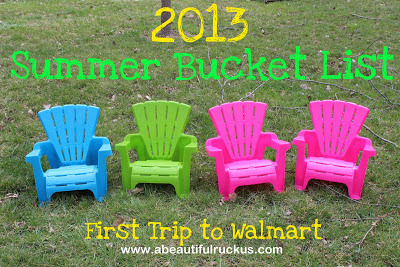 I never figured that Walmart would be such a major milestone in our family's life. Weirdly enough, it is. Since our quads were so premature, born at 27 weeks, 6 days, they haven't had much of an immune system. With two years of being on lockdown, only broken up by a few trips to church last summer, we haven't really gone anywhere normal. So last week, I decided it was time to do something normal with them. A grocery shopping trip was in order, so I seized the moment. Thankfully, my good friend Beth was hanging out with us that day, so I roped her into helping me. She thought it would be a grand adventure while I was nervous about how it would turn out. We loaded up the kids in the car, I remembered to grab my grocery list, and we drove to Walmart. And then I thoroughly spazzed out. It wasn't the people or the potential questions. It was the thought of all of the germs floating around in there. Having preemies has instilled in me some major germaphobia. So while Beth wiped down two carts with the Clorox wipes we brought with us, I gathered my courage to unload the kids and charge into the germ infested public store. We split the kids into two carts and buckled in the kids most likely to try to bolt. I started to feel better about the idea as we walked in, but then some guy sneezed and didn't cover his mouth right in front of us. Only a smile from Beth kept me going. Now that you have a good look at the crazy workings of my mind, I can tell you that the trip went really well! The boys' cart had to keep moving, or Caleb would try to stand up, and Ellie couldn't believe all the "yummy!" things the grocery store had. In fact, she kept trying to eat the produce in our cart. During the time we were in there, she tried to eat a banana (peel and all), a sweet potato, and managed to open the package of strawberries and start in on those. It was kind of hilarious because she couldn't understand why she had food in front of her but wasn't supposed to eat it. I really should have stopped to take a photo. It was pretty cute! The kids only started getting impatient once we got to the checkout line, but we successfully walked out with a week's worth of groceries and no meltdowns. Score! Beth and I rewarded ourselves with a job well done by swinging through Chipotle with my buy-one-get-one-free coupon for lunch. Call me silly, but in our family, it was celebration worthy! My twins were 2 before we took them to the store regularly (before that maybe 3 times when I had no choice but to take all the kids), but not because of germs, just because we only take 1 kid at a time or it gets crazy lol. Hubby and I take turns each week with 1 of the kids to have a little 1 on 1 time. My Caleb has been going through a phase lately of licking everything. I wanted to throw up when he leaned over in the shopping cart to lick the handle, gag! Probably why he ended up with a mystery fever a few days later. :P I never thought about how gross shopping carts are until I had kids! Good for you!!! Now what's NEXT on that Bucket List of yours?? 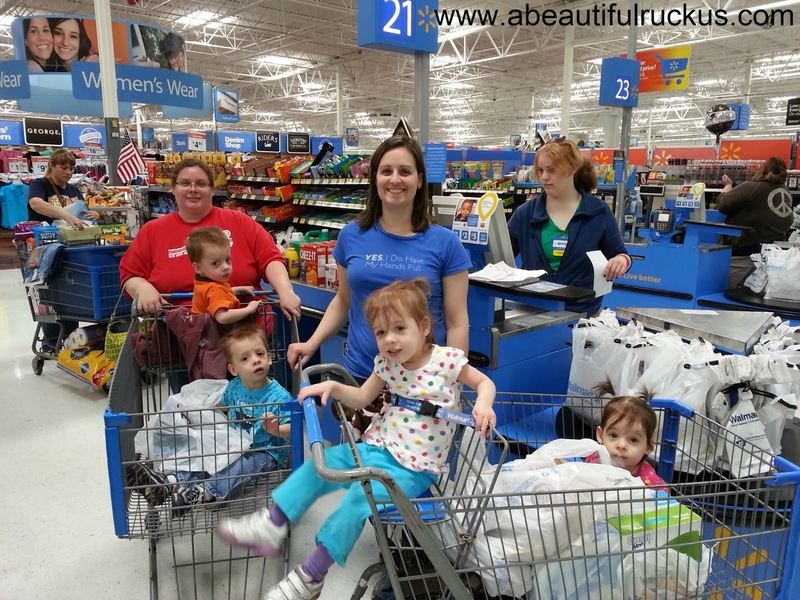 With quads, a trip to Walmart IS a big deal for many reasons. Getting out like that is really good for everyone and enriching to the kiddos. We have taken our babies out several times since the end of lockdown and with calculated procedures it always goes smoothly. Walking babies will be a game changer though! Does your Walmart have those car carts? 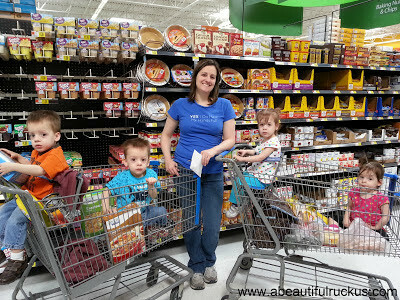 I noticed our Walmart and Kroger have them and they can hold four kids!